The Old Slate Quarry is located a short distance from Knightstown on Valentia Island. The quarry was opened in 1816 by the Knights of Kerry and supplied slate to such prestigious places as London’s Houses of Parliament and Westminster Abbey, as well as the San Salvador railway station in South America. The quarry operated for almost 100 years, employing as many as 400 workers at its peak, and was finally closed as a result of a rock fall at the mouth of the quarry in 1911. It reopened again in the late 1990s and is currently back in operation, with quality slate products being produced by six members of staff. 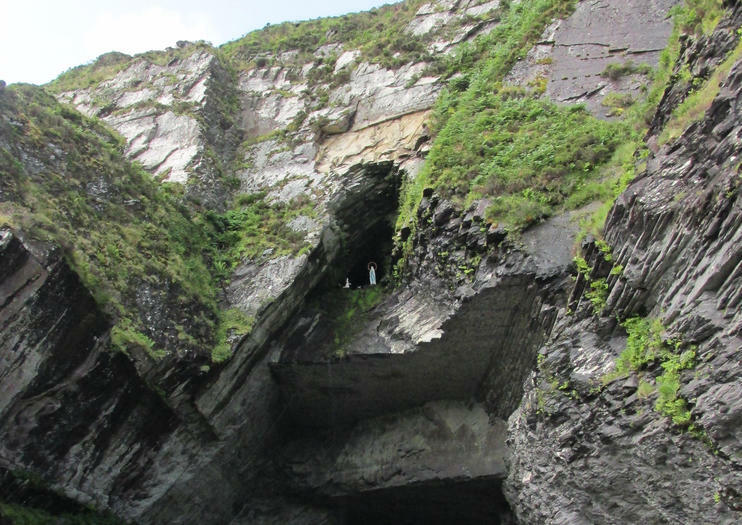 The site is also home to a huge natural grotto that was built into the mined quarry. Today, this is a popular spot for visitors who want to take advantage of the peaceful setting and dramatic panoramic views out to sea. The Old Slate Quarry is located on Valentia Island, just of the Ring of Kerry route. For the best views on the approach, leave the car at the crossroads leading to the island’s lighthouse and follow the winding road through the Glanleam woods.